On June 22, 2014, the 3,500-year-old Poverty Point archaeology site in northeast Louisiana became the 22nd U.S. World Heritage site. If things go as planned and hoped for, the colonial missions of San Antonio, Texas, will become the 23rd when the World Heritage Committee next convenes. In both cases, local people are hoping for a tourism boost to the economy. This is not wishful thinking. Cahokia Mounds, Illinois, for instance, has seen a ten-fold increase in visitation, to some 300,000 annually, since World Heritage inscription. Dealing with tourism at archaeological sites can be a sensitive matter, however—even more so when World Heritage comes into play. Archaeologists have publicly expressed concern about hasty inscriptions made without a tourism management plan. Some sites can get too much tourism, overwhelming and degrading the site; others may get too little, generating insufficient revenue and losing out on a chance to educate visitors. That’s because a World Heritage listing may not automatically confer tourism benefits. It’s just the first step. 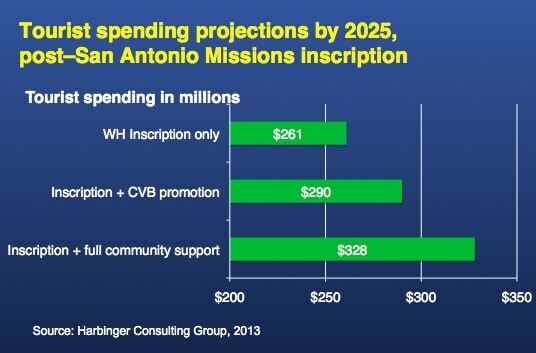 Bexar County, Texas, home of San Antonio and its missions (including the Alamo), hired the Harbinger Consulting Group to determine just how much difference World Heritage recognition would make there—especially increases in jobs. After reviewing what has happened at various sites around the world after inscription, the consult ants evaluated the likely outcomes for San Antonio. Their model showed that inscription alone would result in no more jobs in the following decade than current growth trends would generate anyway. But if tourism agencies such as the Convention and Visitors Bureau aggressively promoted World Heritage status, the job count would go up. And if the region’s communities also pitched in, the count would go up a lot more. 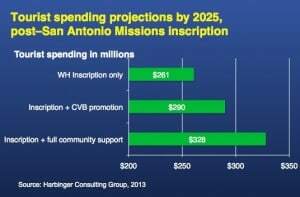 According to the Harbinger study, in the decade following inscription, if combined with full community-wide promotion of World Heritage status, Bexar county would likely see a 26% increase in economic activity over the current tourism trend, with more than a thousand additional jobs and $2 million in additional hotel tax revenue. San Antonio already has plenty of tourism, but Poverty Point and the struggling rural parishes of surrounding northeast Louisiana don’t. The historic site itself is well run and can probably handle a significant increase in visitors. The region around it has much potential for heritage, agri-, and eco-tourism, but food and lodging consists largely of generic off-ramp franchises next to I-20—not attractive to the geotourism-type market. Last year, I was privileged to prepare a rapid geotourism assessment and set of recommendations about the site and the northeastern Louisiana region. Interested Louisianans and others are welcome to contact us for a free copy. One point of concern: For lay visitors, Poverty Point is a pretty subtle experience—a sprawl of grassy humps and wooded areas. If you don’t take the tour and check out the visitor center, you’ll likely be disappointed. There’s simply not that much left of the great earthworks. It’s hard to view the full extent of the place, and that has spawned various intrusive ideas ranging from overflights to lookout towers and monorail gondolas. Luckily, the growing sophistication of “augmented reality” technology may make such unatmospheric schemes unnecessary; you could point your geo-located tablet or smartphone at the scene and see a speculative overlay of what the site might have looked like 3,500 years ago. Even from a bird’s-eye point of view. Now that could be fun. This entry was posted in All, Findings, Geotourism, Stewardship and tagged archaeology, economic, Louisiana, Poverty Point, San Antonio, Tourtellot, UNESCO, World Heritage by Jonathan Tourtellot. Bookmark the permalink. For anyone who wants the report, just send a message through “CONTACT US” at the bottom of this page. Perhaps The Greatest Attribute of Poverty Point is still Hidden…Perhaps it is time to reveal the Ultimate Secret that Poverty Pointe Holds….Perhaps there are some things that cannot remain Hidden. Perhaps if it was revealed that Northeast Louisiana holds The Oldest Indigenous People On Earth as designated by The United Nation, then ALL of Northeast Louisiana will be a place where The World would desire to visit. Perhaps it is time we truly emerge into the 21st Century and regain the respect and dignity our section of the world holds. Perhaps it is time for Northeast Louisiana step up to the plate and display to the World, Love, Peace, Integrity and Prosperity in the face of so much Global division. Perhaps it is time to UNCOVER and Diplomatically Unite and Share.